An integrator supplying a manufacturer of circuit boards was looking to use induction heating for a soldering application that involved tiny parts. 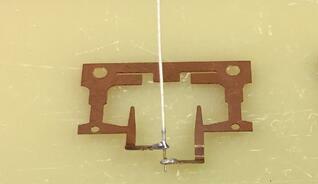 The application involved heating a coaxial wire and a metal frame for soldering. Given the small size of the parts, an EASYHEATTM 1.2 kW, 150-400 kHz induction heating system equipped with a remote workhead was more than adequate for the application. Given the small size of the assembly and its geometry, a graphite cylinder was required as a susceptor. When the graphite cylinder was heated to 400 ºF (204 ºC) -- the target temperature -- the power was turned off and the wire assembly was placed on the cylinder. The solder liquefied at both joints in just five seconds. After the assembly cooled and the joints were solid, the assembly was removed from the surface of the susceptor and the process had concluded. The client turned to induction heating from Ambrell for a number of reasons. First off, THE LAB at Ambrell was able to design a solution that met their very specific requirements. Additionally, the EASYHEAT requires a minimal footprint and the process is highly repeatable. Finally, the assembly heated to temperature rapidly. Click here to learn about other soldering application processes that THE LAB at Ambrell has designed. Interested in getting your application tested by THE LAB? Just fill out this form to get started!